On Twitter, someone starts a conversation on cinematic deaths there's simply no getting over. Sholay's Jai is a no-brainer for me. 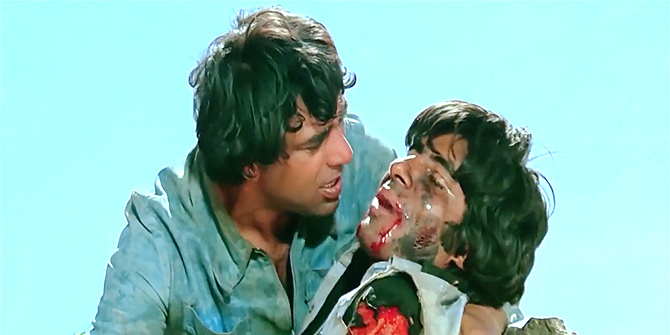 It was voted as the most heart wrenching of Amitabh Bachchan's on-screen death scenes by Rediff readers. I cannot bear to watch Ramesh Sippy's 1975 classic the moment Jab Tak Hain Jaan starts playing. To begin with, the sight of Basanti spiraling on glass shards to keep a tied-up Veeru alive isn't particularly pleasing. But when I first saw Sholay, I construed Jai's rescue-ready swagger, immediately after Basanti collapses, as a sure-shot sign of a clean sweep for the heroes. Also, how can a character with a love interest possibly die? So imagine my horror when Jai sacrifices his life to keep Veeru and Basanti safe. It's the one thing I can never conciliate with even after repeated viewings. I wonder what it would be like if Sippy had actually gone ahead with his plans to reshoot the scenario to a happier one if Sholay's box office fortunes had not turned around overnight. While it breaks my heart to watch Jai go, I am glad Sippy stuck to his vision. If it hurts, it touched the heart. Ram Gopal Varma's Satya completes 20 years today. The outpour of affection for the raw, realistic, underworld drama and its best attributes like depiction of Mumbai's gangster hell, Bhiku Mhatre's blustering sass and unflinching violence proves somewhere deep down moviegoers still believe Varma will snap out of his self-destructive spell and deliver on his promise of groundbreaking cinema. I am all for such optimism as long as it doesn't look anything like Satya 2. A day after Mumbai's incessant rains cause an overbridge to come crashing down, the topic has invariably veered to the city's unrelenting spirit. Just then the shocking news of Sonali Bendre's cancer diagnosis arrives. It is depressing when active, affable and seemingly healthy people fall seriously sick. But the strong-willed tone of her note ('I'm taking this battle head on') and the twinkle of courage in her eyes makes me believe she'll ride out the storm. In one of the most popular songs of her career, Saawan Barse Tarse Dil, a radio favourite during monsoons, Sonali braves Mumbai's heavy downpour and traffic to keep her date. I don't know about Mumbai's, but more power to Sonali and her unrelenting spirit. There's no romance in selfies. Can't imagine anyone getting all googly-eyed over a digital snapshot. The idea had its merits only when characters burst into a song at the sight of their sweetheart's physical photo. In Khel, Madhuri Dixit surrounds herself with poster-sized portraits of Anil Kapoor as an inspiration to write him a love letter. In Dil Hai Ki Manta Nahi, Pooja Bhatt and Aamir Khan play a game of 'my sweetheart is better than yours' over a picture. In The Train, Nanda croons lovesick tributes to Rajesh Khanna's black and white photograph. In Hero, Meenakshi Seshadri sneaks in a photo of the man she loves under the man she's slated to marry. Swooning over photographs could be another addition to my Things We No Longer See in Hindi Movies. Working on Neetu Singh's 60th birthday special makes me realise how much I love her zing. Neetu cannot brag of an extraordinary resume, National Award-winning turns or author-backed roles. At 21, she said bye-bye to movies. And still, her delightful, full-of-beans gameness could give today's shrewdly packaged and marketed youngsters a run for their money. Bollywood needs her unpretentious soul to save itself from pretty-faced robots trained in where to look, what to wear and what to say. Part of a star's success story involved working on the rough edges and gaining polish along the journey. Sometimes I miss the artlessness of yesteryear's talent. 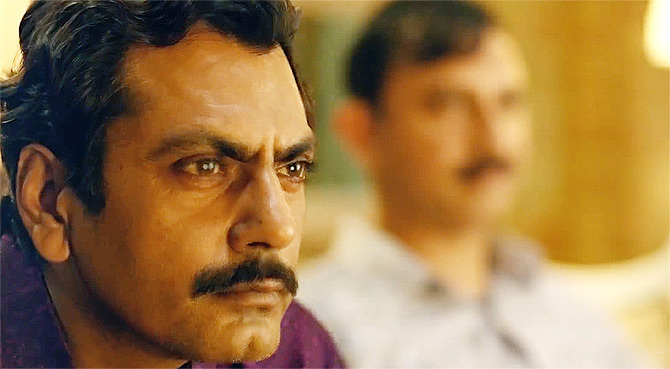 The hugely hyped Vikramditya Motwane-Anurag Kashyap-directed mini-series Sacred Games has dropped on Netflix. Two episodes down, I am impressed by its edgy tone, slick production values and smooth menace. Shame I cannot finish it one sitting. If anyone wishes to enjoy its profane contents on the largest possible screen in complete privacy, it can be quite an uphill task when there's just one television set in the house and your two-year-old nephew insists it'll only play "naughty Donald Duck." Will revert with my opinion in the coming week. Gulzar's Ijaazat released on this day in 1987. I watched it in a theatre close to my house over the weekend. It was raining incessantly that day too. A feeling of melancholy took over as I stepped out of the hall haunted by Rekha's tears and Naseeruddin Shah's regret. I was a changed person. Ijaazat is a sublime gem. Only Gulzar could have explained the complexities of the human condition with as much grace. Sometime back when the author of Written By Salim-Javed: The Story Of Hindi Cinema's Greatest Screenwriters interviewed me for his book, he wanted to know when was the first time I became conscious of the writer's role in film-making. Do Salman's cameos really help the films?